One of the most important moments during a couple’s dating period is the moment of the engagement, as it preludes the planning, and later the execution of a wedding. Traditionally, the man used to surprise his fiancé with an engagement ring. Times have changed, and now couples sometimes select a ring together. The mystery of whether or not she likes the ring has been eliminated with this option. These days, couples are more budget oriented and try to find a happy medium when selecting the engagement ring or the wedding bands. With so many styles and designs available, which display an array of different settings, it may be a bit confusing to select the perfect ring. One of the most beautiful designs and settings is the baguette style. Baguette wedding band and rings have been very popular with brides to be. The cascading design of diamonds or precious stones produces continuity in the piece that is reminiscent of a flowing river of diamonds. It is the perfect style to symbolize a couple’s love. It is one of the most attractive designs, and one that goes well with other diamond or precious stone cuts. The baguette style is made by taking rectangular shaped small diamonds (or cz) or precious stones, and placing them one next to the other in a channel. This setting can be used in small proportion to accentuate the center stone, or it could become the main attraction in a piece, such as in the case of baguette wedding bands. You may also have an entire band made of different rows of baguettes or a single row in a continuous design such as in the case of a baguette eternity band. In most engagement rings where the center stone will be the main component, baguettes can be place along the side to accentuate the center stone. Being one of the most gorgeous pieces, baguette wedding bands and rings continue to be very popular amongst brides. Some popular styles are baguette wedding bands that alternate a baguette with a round cut diamond and baguettes amongst a pave setting – this style offers a gorgeous and sophisticated look. Baguettes can also be tapered and they are usually placed sideways in a baguette wedding band or ring. It elongates the sides of the piece. The most common settings for wedding bands and rings are a combination of baguettes and round diamonds, and it still is a favorite of many brides and brides to be. Due to the type of cut in a diamond shaped as a baguette, the brilliance will not be as much as it would be for example, on a round diamond. This is due to the light bouncing different through the stone. Different cuts will produce a different effect on the brilliance and fire of a diamond, as the light will enter and will reflect different. In a groom’s wedding band, baguettes are used in a small proportion to accentuate the piece and give it a little extra. The masculine design could include a combination of baguettes and round diamonds, baguettes alone, or even a solitary baguette in the center of the wedding band. Sometimes two or three baguettes accentuate the masculine designed wedding band. It is common to see other color stones with a few baguettes in man’s wedding bands. Sometimes, a thin line of baguettes will be centered amongst a sea of white or yellow gold. Baguette settings must be inspected from time to time to ensure that the setting has not been disturbed and the stones are still fitting tight in the setting. Baguettes are not held secured by prongs; instead, they fit in a channel. A loose stone may give way to others becoming loose and falling from the setting. A jeweler may be able to do a simple check to ensure that all stones are well fitted and safe in the piece. This is common, as well as in the case of a channel set. When jewelry is worn every day, as in the case of baguette wedding bands and rings, we tend to do many things using our hands and jewelry takes a beating. Gold is a flexible and bendable material which and with time some stones in these types of settings may become a bit loose. However, this is not of much concern, and with a once or twice a year inspection at your favorite jewelry store, you will ensure that all your baguettes are nicely fitted in the setting. You can find baguette wedding rings and bands at any jewelry store, department stores jewelry section, catalogs, and online. Buying online will give you the most access to a large inventory of baguette wedding bands and rings. You may be able to find many discounts and deals online. A simple search using the phrase “baguette wedding bands and rings” will show a large amount of sites that cater to brides. Prices will vary depending on the type of band or ring that you buy. Gold and platinum rings will be more expensive than other types of rings of other popular materials such as stainless steel, tungsten, sterling silver. Another factor influencing price is the use of natural, lab created, or synthetic stones. The cut, clarity, color, and carat of the stones in the piece will also determine price. Expect to pay more for famous designers as well. Many times, you will find significant savings when you buy both wedding band and engagement rings, or a matching set, as opposed to buy each separate ring or band. 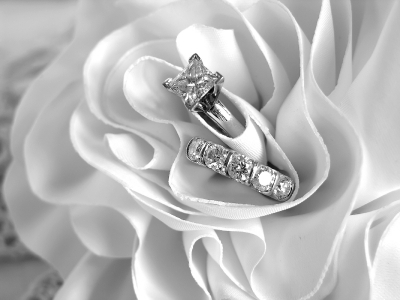 You will find many sales on bridal and wedding jewelry both online and at jewelry stores. When buying online buy from a reputable source or check the business with the Better Business Bureau (BBB) to make sure that you are buying from a good source – anyone can have an online domain these days. Also, make sure that the check out process is done in a secured site (https). Check out consumer reviews, and the site return policy as well. Use common sense, as you would use at a brick and mortar store, but doing a bit more background research. Baguette wedding bands and rings continue to be a very popular choice amongst brides and they present some of the most beautiful designs available in bridal jewelry. The array of pieces is immense, but it also suits every bride, as there are so many different styles. From brides who like bolder styles to more delicate styles with just a hint of flair, there is much to choose. For the guys, this is true as well, as men wedding bands have evolve to include many more styles, which includes a variety of diamond shapes and settings. The many designs will tailor any personality and budget – from the metro sexual groom, to the guy that likes his meat and potato – there is a baguette wedding band to cover it all. Just as a combination of round and baguette diamonds in a platinum wedding band will probably suit the flashier of guys, a solid gold wedding band with a small centered baguette would be perfect for the most traditional of guys. The most important issue is that the wedding bands or rings are a token of the love and commitment that the couple is making to each other and a symbol of their love. Then, when selecting their wedding bands, they can work towards a happy compromise that will fit their lifestyle, personalities, financial goals, and budget. There is a baguette wedding band and ring out there for every couple, and they can have a much fun as they want in selecting the perfect one.